Mercedes drivers Lewis Hamilton and Nico Rosberg have utterly dominated the start of the 2014 Formula 1 season, taking three pole positions and three wins between them in the first three races of the season, following sweeping rule changes within the sport. The car is about a second a lap quicker than anything else on the grid, and the question since the beginning of the season has been why? The answer is to do with clever, innovative thinking on the engine - "a masterstroke", in the words of one leading F1 technical figure. A unique design feature of the Mercedes V6 turbo hybrid power-unit allows it to have specific car design features, the combination of which means it produces more power, more efficiently than the rival engines from Ferrari and Renault. And Mercedes' position as the works team means they were able to exploit it better than their customers. How do the engines work? The new F1 engines are highly complex and innovative pieces of technology. They combine a 1.6-litre V6 turbo engine with two different pieces of hybrid technology. A motor generator unit attached to the rear axle (the MGU-K) recovers kinetic energy during braking, stores it in a battery and reapplies it during acceleration. The amount of energy that can be harvested and redeployed from this is limited by the F1 technical regulations. A second motor generator unit attached to the turbo (the MGU-H) recovers energy from the turbo shaft, which is turned by the exhaust gases. This energy can then be used to either spin up the turbo prior to the driver pressing the accelerator - removing the delay in power delivery, or 'lag', that is inherent in turbo engines - or applied directly to the rear wheels to increase power. The cars have two different fuel restrictions - a limit of 100kg of fuel for a race distance, and a maximum fuel-flow rate of 100kg per hour. The amount of energy that can be recovered from the MGU-H is unlimited, so any energy that can be recovered from the MGU-H is effectively 'free' power for the engine. As a result, this has become a primary definer of performance in the new engines. Turbo engines use a compressor and a turbine to generate more power than the same size of naturally aspirated engine. The exhaust gases spin the turbine, which in turn drives the compressor, which compresses the ambient air before it goes into the engine. The air is then passed through an intercooler to cool it and make it denser for greater efficiency before being pumped into the engine. The turbine and compressor are normally sited next to each other in turbo engines. 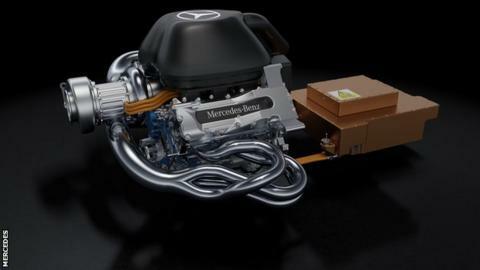 Mercedes have split them so the compressor is at the front of the engine and the turbine at the rear. The inlet air temperature is cooler, which means the team can use smaller intercoolers, reducing weight and taking up less space. The airflow has much less distance to travel from the intake, through the compressor and intercooler into the cylinders. This reduces the pressure loss at the compressor, which increases power. The design reduces dramatically the amount of piping required for the engine, giving a significant advantage both in total mass and weight distribution in the car. It also inherently reduces lag in the turbo to almost nothing, so less power is required from the motor-generator unit attached to the turbo to spool it up before the drivers go on the throttle, so more of that power can be used directly at the rear wheels. The reduction in the ancillaries - reduced intercooler size and less piping - means the bodywork can be more tightly reined in, giving better aerodynamics. The layout also means the gearbox can be moved forward, which gives better weight distribution and centralises the mass of the car, allowing a more effective change of direction and use of the front tyres, which helps with braking and therefore energy harvesting. Ferrari had the same idea as Mercedes, and their compressor is also detached from the turbine. But the Italian team did not go as far as Mercedes in pursuing the concept. Their compressor is only about a third of the way or so across the 'v' of the engine from the turbine, rather than on the other side. Perhaps Ferrari were worried about being able to control the vibrations in the shaft connecting the turbine and compressor if it was as long as the engine. Given this shaft spins at 120,000rpm, that is certainly a huge challenge, and one that Mercedes have met. Whatever the reason, Ferrari's engine department have the agony of knowing that they, too, hit on the idea that has emerged as the key performance differentiator in F1 in 2014, but did not pursue it as far as they could have done. Why are only Mercedes benefiting so much? Mercedes have an advantage over the rest of the field of about a second a lap - which is exactly what Red Bull say their car is losing to the Mercedes on the straights. A car is a combination of the chassis and engine, so it is impossible to completely separate out the contribution of each to its overall performance. But in simple terms, this means the Red Bull and Mercedes cars are pretty comparable in their performance, but the Renault engine is nowhere near as good as the Mercedes. The Mercedes customer teams have not been able to take as much of a benefit from this advance as the factory team because they did not know about it as soon as the factory team, so could not as effectively optimise their cars around it. They did, however, all know by last spring, about the time the basic layout of a team's next car is finalised. But Williams and Force India are midfield teams operating on budgets no more than half those of the top teams. And McLaren are coming off the back of their worst season in more than 30 years and still rebuilding to where they expect to be in terms of car design. Their huge engine advantage explains why these teams are suddenly able to compete with Red Bull and Ferrari. Can Renault and Ferrari catch up? It is difficult to get a completely accurate understanding of the comparative performances of engines in F1, as manufacturers are secretive. But the teams have ways of analysing data to come up with a pretty accurate picture, and the general consensus is that the Mercedes is a long way ahead of Ferrari - about 40bhp - and that Ferrari has a small performance advantage over the Renault. Mercedes' two rivals, though, are not in the same position. Renault's difficulties in pre-season testing were well publicised and the French company admits it is behind on development. Red Bull believe they are losing out in all the key areas - outright power, fuel consumption and the use of the hybrid systems to boost power. Ferrari have similar issues, but their engine power arrives too aggressively, creating a driveability problem out of corners. This is exacerbating the Ferrari's lack of traction. In addition, there is a lack of top-end power which is believed to be a result of the MGU-H not being able to harvest enough power to maintain its boost to the end of the straights. Ferrari's problems with energy harvesting could well be influenced by the car's reluctance to generate tyre temperature - which means it is harder for the MGU-K to recover energy in the braking phase. The teams with Renault and Ferrari engines believe they are unable to harvest sufficient energy to enable the engine to run on electric boost for as long during the race as the Mercedes cars. This, at least in part, is probably a result of the more efficient use of the MGU-H inherent in the unique Mercedes engine design. The problem for Renault and Ferrari is that there is a homologation process in F1 to prevent runaway development - and costs - during a season. Manufacturers have to submit a specification of engine to the FIA pre-season and are only allowed to make changes on grounds of reliability, cost-saving and safety. Software can be changed - and Red Bull and Ferrari both believe they can make big gains in this area. But hardware is much more heavily restricted. And there is no possibility of changing the fundamental architecture of the engine until next year. Which means Mercedes' power advantage - or a large portion of it at least - will almost certainly last all year.